Description：Major suppliers of components and parts to Apple Inc have cut their revenue estimates due to the lower-than-expected sales of the tech behemoth's newly launched iPhone XR amid fierce competition from rivals. Major suppliers of components and parts to Apple Inc have cut their revenue estimates due to the lower-than-expected sales of the tech behemoth's newly launched iPhone XR amid fierce competition from rivals. Foxconn Technology Group, the biggest assembler of Apple's iPhones, aims to cut 20 billion yuan ($2.9 billion) from its expenses in 2019 as it faces "a very difficult and competitive year", according to Bloomberg. Analysts estimate that Apple cut orders to Foxconn by 20 to 30 percent earlier this month, mainly due to weak demand for the iPhone XR and XS Max. Laser sensor maker Lumentum Holdings Inc, which supplies parts for Apple's latest iPhones, slashed its second-quarter forecast, saying that one of its biggest customers had requested to cut shipments. The company now expects net revenue of $335 million to $355 million, compared with its prior range of $405 million to $430 million. Screen maker Japan Display Inc, another of Apple's suppliers, posted a sixth straight quarterly operating loss and lowered its full-year outlook on weaker demand from smartphone makers. Moreover, AMS, which specializes in sensors, cut its fourth-quarter revenue outlook by 15 percent and pushed back its medium-term targets, blaming recent changes in demand from a major customer. In September, Apple unveiled its new iPhone XS, iPhone XS Max and iPhone XR at its headquarters in Cupertino, California. However, media reports said that Apple slashed production orders for all three of the iPhone models. Goldman Sachs trimmed its price target for Apple on Tuesday, saying that the price and features in the new iPhone XR may not have been well-received by users outside the United States. Rosenblatt Securities research showed the iPhone XR sell-through rate remains weaker than it initially expected. "Both foreign and domestic suppliers of Apple are facing huge pressure as sales of the iPhone XR are lower than expected. Some suppliers have tapped into new sectors, such as smart speakers and central control systems for self-driving vehicles, which also have a demand for storage, chips and screens," said Jia Mo, a research analyst with technology consultancy Canalys. Jia added that the suppliers could cut their dependence on Apple and cooperate with some domestic smartphone brands to mitigate risks. Apple is losing out to its smartphone rivals. It recently fell to third place in the global smartphone market. According to IDC, a global market consultancy focusing on technology, Huawei Technologies Co Ltd shipped 52 million smartphones worldwide in the third quarter of 2018, expanding its market share to 14.6 percent, while Apple took 13.2 percent of the smartphone market globally and Samsung continued to top the leader board. Lens Technology Co Ltd, which supplies glass covers to Apple, reported its net profit reached 606 million yuan in the third quarter of this year, an increase of 4.19 percent. However, the company admitted the low yield rate of the products manufactured for its client Apple had affected its profitability. 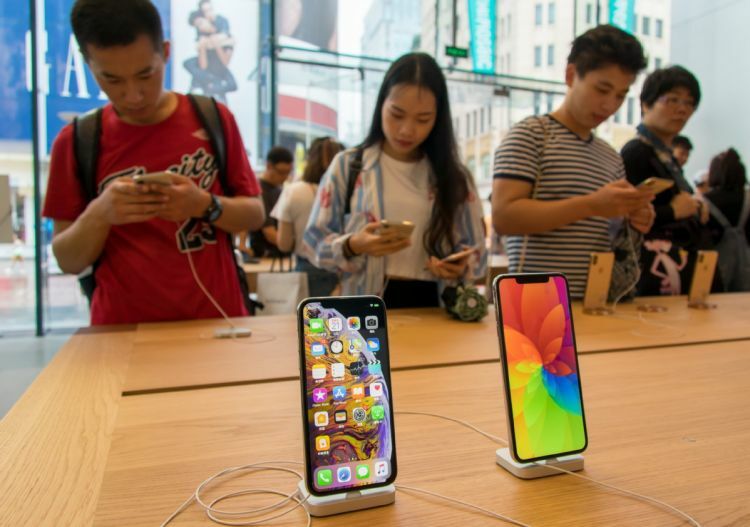 Wang Yanhui, secretary-general of the Mobile China Alliance, said domestic suppliers might be heavily affected due to the sluggish sales of Apple's iPhone, adding that Apple may bargain with suppliers to ensure its profit margins.